Update: This giveaway is now closed. Thanks for all the entries! Winners will be announced shortly! This week, we are celebrating the 4th birthday of $5 Dinners, and my One Dish Dinners Cookbook release (September 4th, pre-order now!). In addition to the multiple giveaways (starting Monday mid-morning) happening over there, I’ll also be giving away 10 of my new cookbooks this week here on One Dish Dinners! 1. Contest ends Sunday, August 26th at 5 pm CST. 2. Winners will be chosen at random and emailed. Thanks bunches friends and good luck! I liked One Dish Dinners on fb. Liked One Dish Dinners on FB. I live One Dish Dinners on Facebook. I did all three!!! I so want one I have all the rest of your books!!! good luck everyone!!! I liked them on FB !!! I liked One Dish Dinners on FB! I shared the give-away on Facebook and I liked One Dish Dinners on there, too! Would love to win one of these cookbooks! I pinned the Beef Fajita Skillet Dinner recipe from OneDishDinners.com and am following Erin on Pinterest, too! Following Erin on pinterest and just pinned the One Skillet Chocolate Chip Cookie recipe! Oh and i follow u on pinterest! I pinned a recipe and follow Erin on Pinterest. I liked onedishdinners on Facebook! I pinned the “Twice Baked One-Dish Potatoes” – it’s on the menu for this week! I already follow Erin on Pinterest. I liked One Dish Dinners on Facebook. Pinned and followed on pinterest. Shared giveaway on FB. Thanks! I liked ODD on FB! I did all 3! Love your recipes! Thank you for this opportunity – I *liked* One Dish Dinners on Facebook! 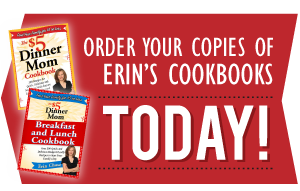 Thanks for sharing your cookbook in the giveaway – I shared your cookbook link on Facebook! I like one dish dinners on fb. Liked your book’s page on Facebook, can’t wait to read it! I liked One Dish Dinners on Facebook! I pinned a recipe & am following on Pinterest. I pinned a recipe – Lentil Minestrone Soup – to Pinterest! I’ve “like you on facebook for awhile now, it’s where I read about the give away. Thank you. But I checked and I had already liked the one dish dinner’s page too. I shared the contest on facebook, hope all my friends jump on over here, I’ve shared recipes and such too. I liked One Dish Dinners on FB! Excited for the cookbook arrival! And I follow you on Pinterest as well. Gosh don’t you just get lost in Pinterest? I repinned Burrito Cup Dinner into recipes. Can’t wait to try it. I like 1 Dish Dinners on Facebook. I’m now following you on Pinterest, one of my favorite places to find recipes. I liked 1 Dish Dinners on FB. Thank you! I follow on Pinterest and pinned a recipe. Liked One Dish Dinners on Facebook. pinned the Stovetop Italian chicken with potatoes and follow you on pinterest. Like one dish dinners on FB. I like One Dish Dinners on Faceboo. Pinned a recipe and following Erin! Shared the contest on facebook! I’d love to win! I like one dish dinners on FB! I already follow you on Pinterest and pinned the stovetop italian chicken with potatoes. I like One Dish Dinners on Facebook! I pinned the Stovetop Italian Chicken with Potatoes and follow Erin on Pinterest. I pinned one of your recipes! !Can’t wait to try it out. I pinned the Italian Chicken with potatoes dinner. I followed Erin on Pinterest. LIKED One Dish Dinners on FB! I pinned Erin’s sweet potato and black bean enchiladas recipe and follow her on Pinterest. Shared on Facebook. Thanks for the giveaways. Following you on Pinterest. Looking forward to trying your Stovetop Italian Chicken with Potatoes! I follow on Pintrest and pinned the Sweet Potato Black Bean Enchiladas – yum! I like One Dish Dinners on FB as Anne Loyd. I follow you on Pinterest as Anne Loyd and pinned the Enchiladas on the one dish meals board! I shared this giveaway on FB by liking it as Anne Loyd. one pan choc chip cookie…. oh heck, most of your recipes! LOVE YOUR enterprise, and Whoopie loves your chicken, lol! My favorite one pot meal is chicken potato bake. Any bone in pieces of chicken, taters, and heat up a veggie. Done in an hour with five minutes worth of work. I also get your emails and newsletters. I repinned your cookbook and the southwestern dish. I can’t wait to try it tonight for dinner. I follow, pinned and am really excited about this giveaway! Liked on fb, followed Erin on Pinterest and pinned this. I pinned Coconut Chicken and Rice and followed you on Pinterest. I follow Erin on Pinterest and pinned the Cheeseburger & Fries kebabs! I am following on pinterest and pinned Italian chicken wish. I “Like”-d “One Dish Dinners” on Facebook. Shared on FB, Like on FB, pinned on Pinterest. Looking forward to pinning more recipes and trying some!! I repinned the Chicken and Spinach Enchiladas. I like your spinach and chicken enchiladas. I would love a chance to win your cookbooks and crockpot! I have e-mail newsletters from you. Thank you! I pinned from Erin and am following her. I love the easy Mexican dinners, Rice and red beans. I receive $5 Dinners by email. My favorite dinner is Mexi Chicken. I liked! Love your blog! Stumbled on this site today, I’ve got my eye on the cheddar chicken bake. I “liked” ODD on FB! I pinned a recipe from One Dish Dinners.com and Liked you on Pinterest. Now following you on Pinterest and pinning MANY recipes and ideas! Favorite one dish dinner: chicken and vegetable curry! Repinned pumpkin pie bites on pinterest. I follow on e-mail and FB. Will also share on FB!!!! I liked One-Dish Dinners on Facebook. Brown meat and onion. Drain off excess grease. Add noodles and canned tomatoes. Chop tomatoes a little bit while in the pan. Bring to a boil. Reduce temperature and simmer covered for 7 minutes. Stir. Cover and simmer 8 more minutes. Thatâ€™s it! My favorite one dish dinner is a chicken and stuffing bake! I liked you on facebook and followed you on pinterest. I think everyone should have Chicken Divan as a staple go-to one dish casserole. 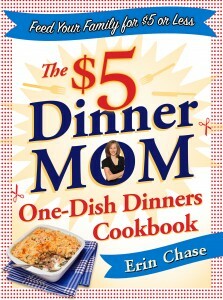 Liked One Dish Meals on FB — excited to see the new cookbook, congratulations! I pinned a recipe and followed you on pinterest. My favorite one-dish dinner is lasagna in the crock pot! I love your one dish coconut chicken with carrots and rice. A simple dinner, with easy clean up and all 4 of my kids love it – that is rare! I pinned a recipe and you on Pinterest. Favorite one dish meal– chicken stew with biscuits! Great give away……liked on facebook. Liked on Facebook and really enjoy your blogs! I like ODD on FB! I pinned the Cheeseburger and Fries Kebobs. They look delicious. I like One Dish Dinners on facebook. I pinned the Italian Chicken and Potatoes and follow Erin on pinterest! I liked One Dish Dinners on Face Book. I pinned a recipe from One Dish Dinners. I am following Erin on Pinterest. I shared the giveaway on Face Book. I’d love to have a copy of the cookbook. I pinned the cheeseburger kebobs from one dish dinners. I like your $5 dinners page on FB. I liked one dish dinners on fb & shared it on my fb wall. I repinned the chocolate chip cookie skillet and followed erin on pinterest! I follow Erin on pinterest and pinned fiesta beans and rice from one dish dinners. Pinned a recipe (Lemon Pasta with Ham and Peas) + followed on Pinterest! Would love to be a dinner to try all of the one dish dinners – chocolate chip cookies, fajitas, pasta…YUM!!! My favorite “one dish” dinner would have to be Chili. It is also my dear husband’s favorite. We love experimenting with new recipes and trying a new one this Thursday. I subscribe to One Dish and like them on FB. I pinned Chicken and Potato â€œStirfryâ€ on the Grill and I am following Erin on Pinterest! I liked One Dish Dinners on FB. Thank you.